Update! 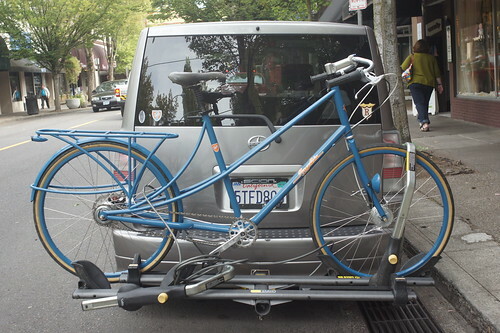 This is NOT the Oregon Manifest bike… it’s Curtis’ wife’s town bike. The OM bike was inside the car the whole time! Maybe this is why my career in industrial espionage never took off. Inglis Oregon Manifest 2011 bike, originally uploaded by BikeTinker. This was parked across the street from my work today. Pretty sure it’s the Inglis entry for the Oregon Manifest Challenge. Internal 8 speed, dyno/drumbrake front hub with a clever ‘slot’ for the reaction arm to make it simple to remove the front wheel. Seeing this made my day! I brought Ari and Mitch over separately to be amazed. They were. Yeah, they had her bike at the Cargo Roll Call event during Pedalpalooza. He said it was inspired by seeing Tony’s longtail from a few years back. Which was inspired by Todd’s design. Interesting now how Todd’s Brompton love is influencing his most recent design. As for me, I love seeing how the utility designs are evolving. I think it’s like being part of the Rando scene in the 40’s. I take that back. It wasn’t Curt Ingliss wife’s blue long-tail mixte at the Roll Call, it was Jonathan Reed’s. Obviously, as Ingliss doesn’t live in Portland. Dunno what instigated that brain fade — kind of embarrassing. No worries – less embarrassing than scooping the world on the wrong bike. I just wandered off reading your links! I love the chat on Clever Cycles’ blog about your longtail Pereira, and Todd’s exegesis of his Xtravois. Thanks! Yeah, Todd runs a pretty good blog. I felt like I was getting carried away on the links, but since you seemed to appreciate them, here’s where Todd makes his Brompton love known. Enjoy.